Longquan sword was developed during the Warring States Period (475-221),from 2600 years old of history. During the Warring States Period there was a swordsmith named Ou Ye zi who accepted the orders from the king of Chu to smith a sword for him. Ou Ye Zi visited many auspicious places in order to find the most suitable location for his work. Finally he came to Longquan. At Longquan there were seven wells in the shape of Ursa Major (the Big Dipper) and beside there is a beautiful lake. Upon viewing the landscape he decided that Longquan was the place where he would conduct his work. 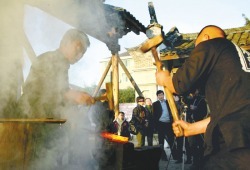 Ou Ye zi provided the best iron in the world and made 3 famous swords, named Longyuan, Tai er, Gong Bu. All of them were extremely sharp and the blade of each sword were inticately engraved. 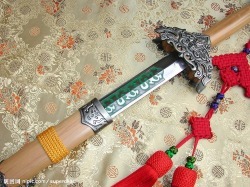 These awe inspiring pieces of work continue to hold a strong reputation in the kung fu world and swordsmithing. Swords use to be a weapon on the battlefield,the sword edges are extremely sharp and fine,the swords appearance is very beautiful and the shape is very simple,and that is why the swords are apprecated and respected. Chinese feng shui theory believes that sword can quel bad lucks and to put a sword at the house can protect the house and also to keep the family safe. In aristocrat or government authorities mans sword usually representative respected,power and prestige,literati of the sword represents the refined brave and aspiration. The modern times people have an appreciation for swords,sword is a very special antique and its more easy to stir up the will of the people and to teach people to cherish memories of the past, Come to understand history more deeply,when a person is admire swords then there can understand the Chinese culture development.